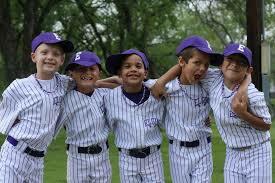 Youth baseball uniforms come in a wide variety of styles and colors. A youth baseball uniform can be as simple as t-shirt with a number on the back that had coarsely painted on with a stencil. 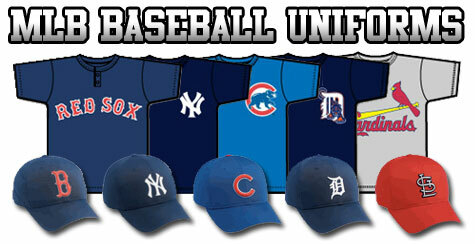 Or it can be a replica of exactly what the Major Leaguers are decked out in. Most youth baseball uniforms are going to fall somewhere between those two extremes. For the most part, a youth baseball player will get his uniform when he signs up for his team and the cost of the apparel will be included in any registration fees. This is because everybody on the team needs to have the same uniform and it would be almost impossible to achieve this “uniformity” if each parent was deputized to go out into the marketplace and purchase the correct uniform. However somebody, whether it is the coach or a league official, does have to buy the uniforms as well as make the decision on how elaborate they should be. This makes economic sense too, for when buying in bulk you can get much better prices on Youth Baseball uniforms. In fact, you should be able to pay less than ten dollars each for the major components of a youth baseball uniform, including the jersey, baseball pant and hat. There are many websites that cater to these bulk purchases and you should be able to find them simply be searching for “Youth Baseball Uniforms” on your favorite search engine or web browser. A salesperson or representative at your local sport goods store would also be more than happy to help you outfit a youth baseball team. One of the ways youth teams have traditionally defrayed the costs of their uniforms is through sponsorships. Whether it be a car dealer, the drug or pet store or even the sporting goods store that sold you the duds, local business are often willing to pay the cost of a youth baseball team’s uniforms in exchange for displaying the name of their business and the logo. Sometimes the extent of their deal will also include providing refreshments after the game or a ten percent discount for team members and their parents of the team at the business. There are some times individual parents do have to purchase Youth Baseball Uniforms, or at least parts of it. Many leagues don’t provide baseball pants or stirrups, but a youngster craving a more 360 degree hardball experience may want them. In this cases your local sport goods store or Amazon should work fine, and the apparel should be fairly inexpensive. Youth baseball uniforms also make for great Halloween costumes. However in this case you would probably want to get a the pint sized version of your little tykes favorite big league team. You should be able to find these “costumes” at MLB.com as well as the team’s individual website.